These are my HRT results from 2-January-2006. Look for my next HRT results around the end of January 2007. This test was performed with an HRT-II. The HRT is a Heidelberg Retina Tomograph (also called scanning laser tomograph). It is made by Heidelberg Engineering, a German company. 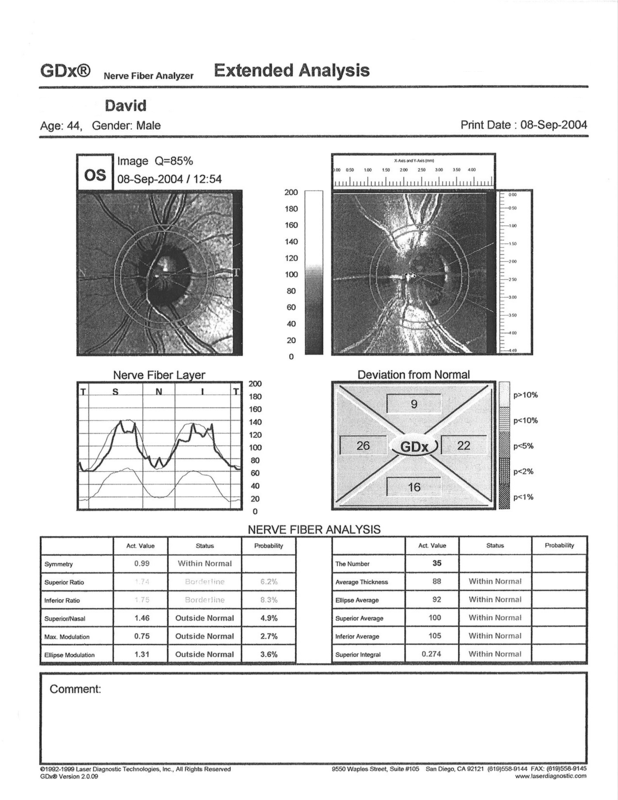 These are my one-year follow up visual field test results. These tests are only the 2nd time I have had the visual field test peformed. The first tests were done on September 8, 2004. This eye exam was performed at an elevation of about 8000 feet using Goldman tonometry. At 8000 feet elevation, normal intraocular pressures are about 21, I'm told. I'm not completely sure, but it seems like the downward trend in my IOP is continuing. This is also the first time my right IOP has been lower than the left. I'm also on vacation, and that might have something to do with the IOP values. Wow! My IOP has decreased each and every visit to my ophthalmologist. This is a good trend. Here are my GDx results for today. At this time I cannot obtain these GDx results in color. 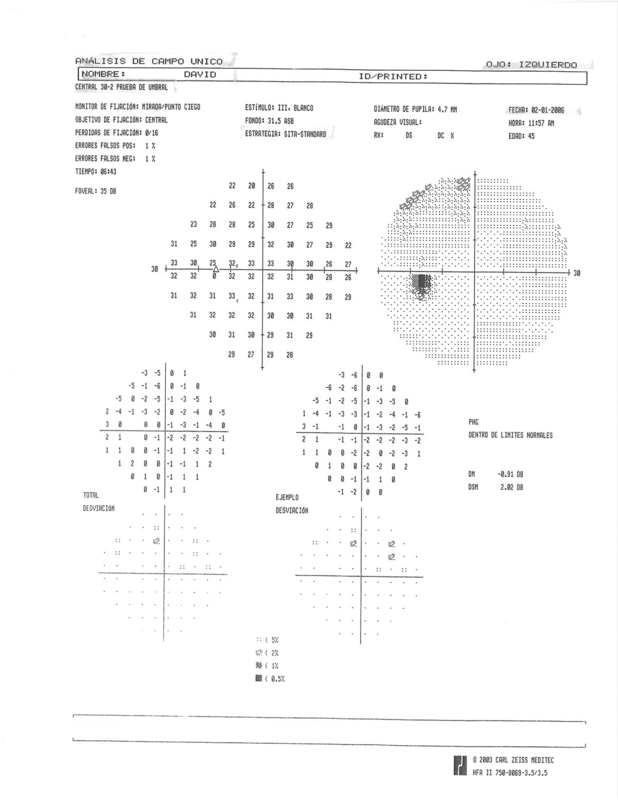 I'm posting my visual field test results. This was the first time I've had a visual field test done and I did not enjoy it at all. The test is a bit long (about 10 minutes per eye) and boring, but the worst part is that the test reminds me how much damage has been done to my optic nerve. During the test, when I don't see any lights for a long time with my right eye, I know I'm not performing well. It's just no fun. However, I shouldn't complain because the test is not painful at all and there are a lot worse things I could have to suffer though than this! 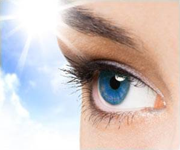 Due to the optic nerve damage I have already suffered, I must control my intraocular pressure (IOP) very well -- and allopathic medicine has the most effective tools for doing so. Of course, I'll still seek out any knowledge about lifestyle factors that could benefit glaucoma and lower my IOP. Like so many others, I have a health condition that doesn't have any easy answer. Pigmentary glaucoma (noted Krukenberg's spindle); scotoma (an area of decreased or loss of vision). It is still very hot where I live, and the doctor still doesn't use the air conditioning in her office. In spite of the discomfort, I returned for another visit. We reviewed all my lab tests, but she mostly focused on lifestyle factors. I have a lot of respect for that approach. Today I had a telephone consultation with another member of my medical team, an ophthalmologist who is the current President of the Alternative Medicine association (since 1996) for his country. He has been in private practice since 1978. Today was my first visit with a physician in my area who practices conventional and holistic medicine. My main reason for seeing her was to see if she had any advice regarding alternative treatments for glaucoma. She gave me a complete physical and sent me to the lab for blood and urine profiles. She wanted to check my kidney function because, in her view, the health of the kidneys influences the health of the eyes. Just to be clear what I mean by that, my left eye IOP is 34mm Hg and right eye IOP is 48 mm Hg. How about a big IOP surprise for your birthday? My wife gave me the new pair of Oakley prescription eyeglass frames I wanted for my birthday. It seemed like a small inconvenience that Oakley required me to obtain a new prescription before I could actually get my glasses. My existing prescription was about two years old, but it was obvious to me that my vision had not changed one bit. I was seeing 20/20, or better, with the current prescription and I was sure it was fine. Read more about How about a big IOP surprise for your birthday? "Take care of your eyesight, particularly your right eye"
Read more about "Take care of your eyesight, particularly your right eye"